Thats a good deal, not sure why it's started out cold but have some Heat from me! Due to the popularity we have sold out of a couple of the variants. We will be fully re stocked in May and we want to roll them out to more stores. I went to the shop this morning (Glasgow) but I did not see any of them. How is that possible? I also asked a store assistant and showed her a photo but she does not know anything about it as well. why would anyone go all the way to morocco looking for blag perfume? Imodium Instants 6 pack £2.19 @bodycare instore only. Usually £3 plus in most places This was instore in Glasgow, prob nationwide. Life saver if your sitting on the crapper and want to take a couple. No water needed. I can't swallow the capsules, mind you I'm useless at paracetamol too. Heat for the price of the specific product. In this case they claim to work faster because they're taken sublingually. I don't know how well proven that is, but it's not a straight generic loperamide vs Imodium thing. You are of course 100% correct about the regular pills. Hermesetas Mini Sweeteners from Bodycare @ Highcross Leicester. I’ll give some heat here. Needed some at the weekend and Tescos were selling this brand (although 600 i think) for £4.50ish. Ended going for Sweetex as it was much cheaper! This is lovely. 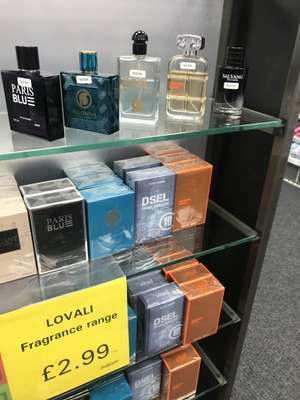 Its more a mum/nan type perfume if you know what I mean. For those of us who like to wash our faces, and I know it’s not many in Britain, I saw these in Wilko fo £4 today. Bodycare, however has them reduced from £1.99 to £1.49 each. best do your research before just listening to others comments, everyone has different skin types and will have to choose a suitable product accordingly. I also totally agree. I have had nothing but bad experience of using the blue one on the face. It is too dry. And somehow fills my face with pimples. On the other hand, white one is much better than the blue one. I have the blue one of these and I would not recommend it. The blue one has alcohol in it which is not ideal for the skin and should never be put into facial skincare as it dries out the skin and forces you to use moisturiser (which Nivea conveniently suggest you also get with this). So if taking advantage of the deal I highly recommend going for the white version of this. Issey Miyake 125ml Eau de toilette - £35.99 @ Bodycare. Shame, I thought this was a bargain fridge. Fluoride Travel Kit. Was 99p now 95p!! Only at h2f Bodycare. ​bit harsh and quite upsetting comments. thanks. I cn afford my everything for my child thanks. work extremely hard too. just tryin to help others out. also I did not know about the NHS being charged so much money for things so please don't bite at people please. bit harsh comments to be fair. I was just tryin to help people save money and I work hard full time and pay my way and dont recieve any help so yes I can afford everything for my baby but if I can get a bit of help then why shouldn't I take it. I pay my taxes and national insurance and give to charities so receiving paracetamol on prescription rather than buying it. sorry but surely I'm entitled to it! as I said I was just trying to help!! Coilef much, much better. More expensive too but available on prescription. Or alternatively if you choose to have children then make sure you can afford basic items for them, like nappy rash cream, teething gel and colic relief. No wonder the NHS is in such a dire state with so many people leeching every penny they can out of it. If you get this item under the minor ailments scheme then the NHS has to pay £8.20 for it, or YOU pay £1.89, where is the sense in that? I pay for my own children wherever possible, try it, you might like it! Nivea Q10 Plus Anti Wrinkle Pore Defining Day Cream £2.79 at Bodycare, Dundee.